I’m on vacation this week, with my family, in beautiful Sandbridge, VA. We come here every year for a week, to slow down, get some beach time, and be together without a schedule. The weather has been gorgeous (up until yesterday and today, which are cool, just dipping below 70 degrees, and a bit rainy). Still, it’s so great to be here. One of the things that vacations like this do for me is give me time to contemplate. I love this opportunity. I always bring along a book or two to read, which I’ve been wanting time to dive into. 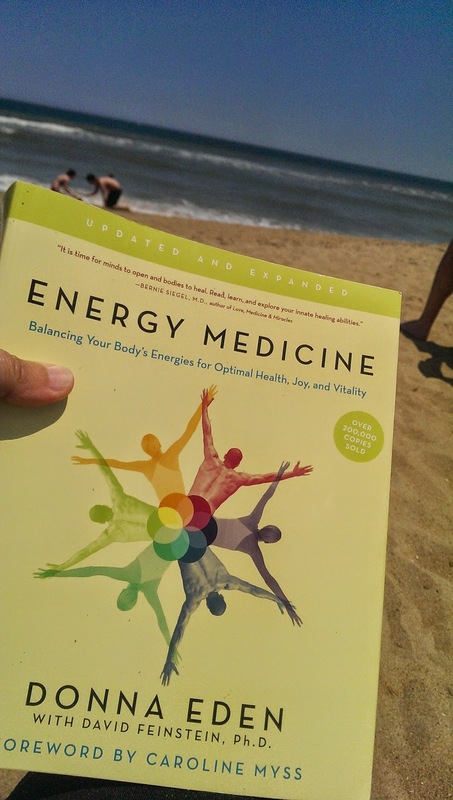 This year, I brought Energy Medicine by Donna Eden. I have been enjoying it very much, and learning a lot too. I intend to continue learning about it when we get home. This year, I’ve also been contemplating two very different driving philosophies of energy healing. I’ve learned a bit of both, and I’m pondering the ideas of how they might work together, if they need to work together, and the ultimate effects and usability of each. Dr. Lawrence LeShan calls them, perhaps a bit clinically, “Type 1” and “Type 2” healings. These defined types aren’t at all unique to his method of healing, but the designations describe two paths to working in this scope of the energy healing field. The first one, (he calls this Type 2), is the one which is more widely practiced. This describes any approach in which the practitioner is the facilitator, and the recipient is the one receiving the healing. Reiki is in this category, as well as acupuncture, acupressure, Energy Medicine, Therapeutic Touch, Cranial-Sacral Therapy, and most common energy healing modalities. There may or may not be manipulation of the physical body or energy field involved, either through intention or pressure, or both. I teach my students that the recipient is healing him or herself by receiving energy which helps him or her come into balance. The practitioner helps to create a “healing space” around the recipient by initiating and offering a connection to a flow of Life Force Energy. In this type of healing, the practitioner is able to observe the recipient’s energy field, if he or she so desires, and may receive some intuitive information about the ways and places which may be off balance (and engaged in a process of self-correcting during the session). The practitioner becomes the observer of the process, after intending that the energy flow to the recipient. In this type, the practitioner and recipient are in separate roles, with the first offering and observing the latter, who is receiving. The second type (LeShan’s “Type 1”) is different. Essentially, this type requires the practitioner to go into meditation, and then to intend to include the recipient of the healing in this meditative space with him or her. It is thought that when we are in this meditative state, we are connected fully with the All One energy field which is our true essence. In being connected with this true essence, we naturally will be able to experience a return to balance; a clearing, a healing, a wholeness. The practitioner intends to merge into this All One field with the person receiving the healing, so in this sense, the two are not separate, but together inside the All One energy field. There is no observing, because that implies separateness, as in, “I am over here observing you, who is separate from me.” You can’t observe because that makes you step out of the experience. You are just to BE in this state, and flow with it, and allow whatever happens, whatever you might experience, to occur. Then you’re done. The LeShan Method is not the only method that follows this philosophy. There are others, with different names, that encourage doing the same thing. Some call it Non-Local Consciousness healing, or something of that nature that means entering into a deep meditative, altered state of consciousness. I’ve read of a man who will sit in the room with someone who is ill, and go into deep meditation for hours. Then the ill person experiences healing. Also, people such as John of God and Braco seem to affect a healing process by looking at, being in the presence of, or touching the recipient. It’s a presence – an energy of Beingness- that acts as a catalyst for the healing. I feel that these are also similar to the ‘Type 1″ LeShan Method that I learned in April. Both philosophies are valid, and may offer beneficial, sometimes “miraculous” results. Yet, they are so different that they can’t be combined together without doing one first, and then the other. I’m able to offer a healing session in which I do the meditative type first, and then switch to offering Reiki. This involves intentionally shifting from the All One state to that of the facilitator-observer. As a Reiki practitioner, It’s often more comforting and validating for me to be in the place of the observer, because information comes in – I can intuitively tell which chakras are blocked, or where the recipient is experiencing physical or emotional pain. Then I can share these insights with the person, and get feedback from him or her on how my observations and the healing session resonate. It is satisfying on some level to have this interaction. With the “Type 1” method, on my end, offering the meditative state healing brings me only the sort of deep, blissful feeling of being in a non-physical, flowing consciousness, and perhaps some dreamlike visions. I know that something happened, but can’t really quantify it. The recipient may experience something, but I can’t always be sure that what I experience correlates in any way with her or her experience, and I have no certainty or expectation of any specific results that may occur as a result of this type of healing method. My only intention is for the recipients Highest and Best to happen during the session. It takes a lot of surrender to do this. Still, I find it very intriguing, and the feedback I’ve received has been very meaningful when I’ve offered this sort of healing. So that’s where I’m at, and I’m inviting those interested to follow my journey here, or to actively come with me by joining the Advanced Healing Pioneers, a new membership program, here.